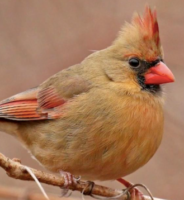 Last Monday, a strange-looking bird with a Mohawk was spotted in the sorority quad, signifying that spring is probably here now. The bird, which wasn’t on campus in the winter, is now back on campus, raising the possibility that winter is finally over. Dozens of people passed by the bird for the 20-minute period it was perched on the tree branch outside the Alpha Omega sorority. Although nobody took pictures of the bird, two passersby stopped for a couple seconds and stared at it apathetically, presumably wondering whether spring had come, before shrugging their shoulders and moving on.